Tony Husband:Game full of incident at the Amex, Brighton denied a blatant penalty moments before Burnley convert their second pen in a week. How decisions can change games and influence seasons. Albion and Burnley now level on points on a big day in the league’s bottom third. Martin Cook:Hands up we got a big slice of luck with the Hendrick decision it was definitely a pen. However, we’ve been on the receiving end of many of those this season. Nice to have something going our way but harsh on them…a much-needed 3 points! Burnley boss Sean Dyche on BT Sport:“It was a good performance in a different way. “I know they’re on a bad run but they did well last week and we knew it was going to be tough. “I thought our two centre-forwards were excellent today. We got better and better as the first half went on. 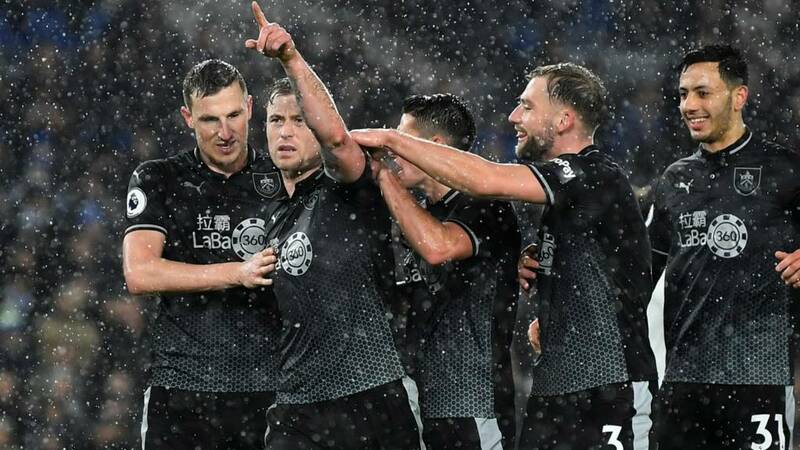 Burnley striker Chris Wood to Match of the Day:“It was a good performance, it’s always tough coming here and we showed we can fight and ground it out. It’s a big win at this stage of the season. Brighton had more shots (16) than Burnley (9) and more shots on target (6-5) than their visitors. However, the clinical strikers of Burnley alongside the fabulous goalkeeping of Tom Heaton ensured they’ll make the long journey back to Lancashire with the three points in their grasp. What a March Brighton have got lined up. Games against Huddersfield, Crystal Palace, Cardiff and Southampton will probably decide whether they really will be part of this increasingly interesting relegation scrap or not. Burnley goalkeeper Tom Heaton on BT Sport:“It’s a massive win. We knew it was going to be tough tonight and they came out of the blocks but we handled them well and it’s a big three points. On the penalty decisions: “In fairness it did hit Jeff’s hand – I don’t think he meant it – but it’s difficult for the ref. Sometimes they go for you and sometimes they go against you – luckily today it went with us. While we’ve focussed on the top of the men’s game here, there are of course so many tiers that are integral to football in this country. Don’t miss your chance to play in the 2019FA People’s Cup! There’s just over a week left to register for the nation’s biggest (and free) five-a-side competition. Find out more about it and how to sign uphere. That’s Burnley first February win in the Premier League in 15 attempts. When these teams played on 8 December, Brighton were 11 points ahead of Burnley. This result leaves Burnley level on points with their hosts just two months later. Burnley players Phil Bardsley and Ben Mee head over to the Burnley fans to celebrate and give their shirts away. Bitter night for that sort of charity lads. Seven games unbeaten for the Clarets. Brighton looking nervously over their shoulders as boos ring out around the Amex. Almost a comedy own goal from Burnley. Yves Bissouma’s cross is comfortably headed away by James Tarkowski only for it to cannon back off Ben Mee. Fortunately for Burnley, Tom Heaton is there to save. Ben Mee is down on the deck after landing heavily heading the ball away. He trudges to the side but is OK to continue. He’s been a titan at the back for Burnley today. Tom:The decision not to bring in VAR this season has dragged Brighton into the relegation battle. It could be 3-2 Brighton. That and the one win in 11 will be the reason I think. Burnley digging in here as Brighton try to put them under pressure. Anthony Knockaert gets a headed chance from Gaetan Bong’s cross but it drifts harmlessly wide. Tom Heaton, as he’s been doing since the break, will take his time with this goal kick. Scott Redrup:Hey Heatahfajita, probably because Heaton and Pope have had injuries….. Hart was the best move they could have made (other than signing Crouch early and sticking him in goal). Ian Taylor:So so so unfair football sometimes. I think Brighton have been great but unlucky with their finishing,they should be miles ahead.This ref has a lot to answer for by the way. He has missed 2 clear Brighton pens tut tut. Ben Peterson:That is extraordinarily bad officiating. Stonewall penalty for Brighton not given leads to penalty for Burnley and a two-goal swing in about 15 seconds. For what it’s worth, I think Brighton had a strong case for a penalty seconds before Burnley got theirs. Murray lost control in the slippery conditions and it bounced up awkwardly onto Jeff Hendrick who seemed to bat it away with his hand. Vigorous protests from the Albion players but nothing was given. How crucial that could be.